This print is a mitate from a different series of Nana Komachi. 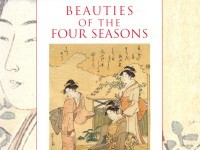 In the book at the left top corner with cherry blossom, the same poem by Ono no Komachi is inscribed [see EAX.4436] but the mitate images are different. 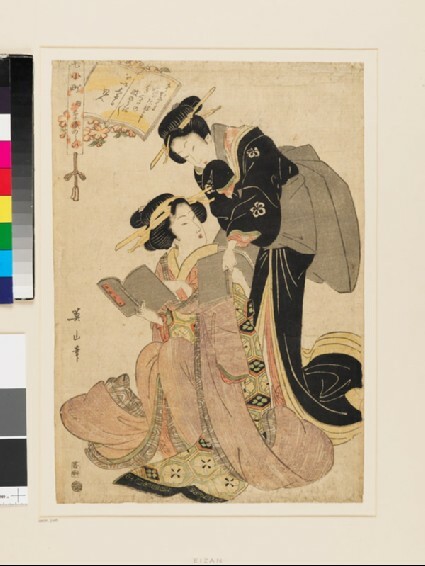 This derives from the image of Utamaro’s version of Sōshiarai-komachi (1801-3), which illustrates a scene of a mother and a daughter looking at a tenarai-sōshi (booklet of poems). In this print by Eizan a woman leans over the shoulder of another, offering a sōshi book as a substitute for the one she is reading. Mitate, or riddle, is a form of visual and literary parody on a classical theme. It required prior knowledge in order to decipher it. Mitate-e, or riddle, is a form of visual and literary parody on a classical theme. It required prior knowledge in order to decipher it.